Alexander puts her most striking claim up front. In the book’s first chapter (which reworks material from her JQR article of 2007), she analyzes the Mishnaic rule, and in particular, its locus classicus, m. Kid 1:7, which states, “All timebound, positive commandments—men are obligated, women are exempt.” She argues that the rule originated as a summary of legal exegeses concerning tefillin in the Mekhilta, which, in close proximity, biblically derives from women’s exemption from that commandment and its time restrictions (i.e. that tefillin are not worn on Shabbat, on holidays, or at night), while utilizing its status as a positive commandment. 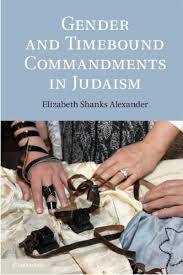 But in the Tannaitic period, Alexander argues, women’s exemptions from various mitzvot did not originally derive from those mitzvot being positive and timebound. Rather, the Mekhilta exempts women from the commandment of tefillin because of its link to Torah study. Alexander claims the Mekhilta passage preceded chronologically and was the impetus for other Tannaitic uses of the phrase. The phrase “timebound, positive commandments” functions almost as a proper noun, alluding to previously known rulings, rather than prescriptively generating new ones. Because the rule is not really a rule, it makes sense that there are many timebound, positive commandments to which women are subject, like tefillah and kiddush. The second and third sections of the book expand and supplement the core claim. In a complex, close analysis of the relevant sugyot in the Yerushalmi and Bavli, Alexander argues that early amoraim recognized the stylistic imperatives behind the phrase and did not attach to it ultimate legal significance. Only the latest redactional layers of the Bavli elevated the rule to prescriptive and universal status, though, as she notes, they did so only theoretically, without actually deriving new exemptions. Just as pressures of style and transmission created the rule in the Tannaitic period, so too the Bavli’s love of dialectic and literal-minded attitude towards Mishnaic rules elevated the rule to being potentially universally applicable and prescriptive. Finally, Alexander, returning to the Mekhilta, analyzes at length why women were excluded from Torah study. She argues that the Torah study afforded the rabbis a “ritual means of re-experiencing Sinaitic revelation” and helped forge a “covenantal community” that was exclusively male. Alexander claims that the exclusion from ritual Torah study sheds light on both other exemptions and on gender and commandments more generally. Torah study replaces “timebound, positive commandments”—which has turned out to be a red herring—in understanding the rabbinic construction of gender. I am just a layman, but I found Alexander’s core argument about the Mekhilta passage’s priority convincing. Her claim makes good sense of the otherwise odd relationship between that text and m. Kid. 1:7, and it explains why other midrashei halakha are ignorant of the rule. Further, Alexander’s account also answers a basic puzzle behind the category, namely that the phrase “time-bound, positive commandments” does not seem intuitively to have anything to do with gender. Consider also the two classic post-Talmudic justifications for the rule, that women are subject to their husbands and thus not in command of their own time, on the one hand, and that they are higher spiritual beings already in sync with divine rhythms, on the other. These justifications have nothing to do with each other whatsoever; they do not share an intuitive core. Obviously, this later evidence is speculative; and this is my suggestion, not Alexander’s. Still, note how neatly Alexander’s claim dissolves these problems. The rule both is non-intuitive and admits of radically different interpretations, because it was not formulated to encode a substantive legal belief about gender, but to package preexisting information. That said, I have quibbles with the third section, in which Alexander develops the idea that “ritual Torah learning” was central to rabbinic constructions of gender. On the one hand, this section is too long. An extended review of the evidence surrounding the pre-rabbinic development of the ritualized shma, for instance, seems unnecessary for what follows. Also, some of Alexander’s proofs for distinguishing between practical and ritual Torah study (women being excluded only from the latter) are weak. As Alexander admits in her analysis of m. Ned 4:3, “daughters” are found as subjects of torah instruction there only in the sixteenth century Venice printed edition. Similarly, amidst her fascinating analysis of m. Sot. 3:4, Alexander speculates on Ben Azzai’s use of adam (“man” or “person”), instead of av (“father”) to describe one teaching practical Torah to a daughter, suggesting that perhaps Ben Azzai includes women as teachers of practical Torah. But the phrase “chayav adam” is a standard Tannaitic phrase (whereas chayav av is not). Further, “chayav adam” appears often in clearly male-only contexts, like the requirements to circumcise a son in the Mekhilta and to eat in a sukkah in Mishnah Sukkah. More broadly, I wonder about the role of this section in the book as a whole. On the one hand, I think the best evidence for Alexander’s argument is the material about timebound, positive commandments, which she negotiates expertly. The third section’s alternate account of rabbinic gender construction is secondary. On the other hand, the theory of ritual Torah itself demands more space than this book can give. In particular, while the theory contextualizes the Mekhilta’s original concerns, it is not in itself a full account of rabbinic constructions of gender and commandments. If the rabbis exempted women from tefillin because tefillin were part of the ritualized enactment of covenantal community and continuity, the question remains: why were women excluded from this central ritual? Ritual theories, like those of Catherine Bell and of the book Ritual and Its Consequences, which Alexander presents as theoretical frames for her analysis of Torah learning, usefully explain how communities use ritual to embody and sustain dearly held values. But these theories, which are essentially explanations of ritual form, rather than content, cannot explain who constitutes these communities, nor how they choose their values. That is to say, if Alexander has delineated the ideology of ritual Torah study—that is, how its concepts and practices relate internally to each other—she has deferred the question of the motives of that ideology: were the rabbis driven by an evaluation of women’s socio-economic position? their physical nature? their status in surrounding cultures? This question is particularly important for traditional communities. When observant feminists inquire about timebound, positive commandments, I suspect most of us are asking a question that goes beyond the technical rule. The post-Talmudic apologetics, whatever their limits as either descriptions of reality or explanations of the Talmud, do give theories of how the rabbinic ideology about mitzvot reflects broader theories of gender. Nor is this just a question for traditional Jews; it reflects, for instance, the concerns of Ishai Rosen-Zvi’s programmatic essay, “Misogyny and its Discontents.” Second-wave Jewish feminist scholars, according to Rosen-Zvi, worked to name exclusionary or misogynist rabbinic attitudes towards women or to argue, as Judith Hauptman did, that the rabbis attempted to ameliorate women’s condition. In contrast, contemporary scholars increasingly want to define more clearly the sources, patterns, causes, and structure of rabbinic ideology. Alexander’s book contributes to that project, especially insofar as she clears the ground of long-standing debris. But fully explaining how exemptions from mitzvot shed light on rabbinic constructions of gender will require more work. Raphael Magarik is a PhD student in English at Berkeley.